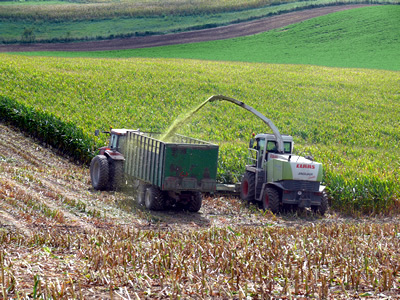 AMES, Iowa – Corn silage has always been a major feed component in dairy and beef rations. However, this year's weather is making harvesting corn silage a challenge for many areas of the state. Northwest and northeast Iowa had excess rain early in the season making planting late so producers in northern Iowa may not be challenged as much with harvest, yet. Eastern Iowa was dry in the spring allowing early planting and now is challenged to harvest before the crop becomes too dry, especially with the heavy rains in September. Southern Iowa has been extremely dry all summer and is finally getting some much needed rain but too late to impact grain crops. While every area of the state has had different growing conditions all have been challenging. 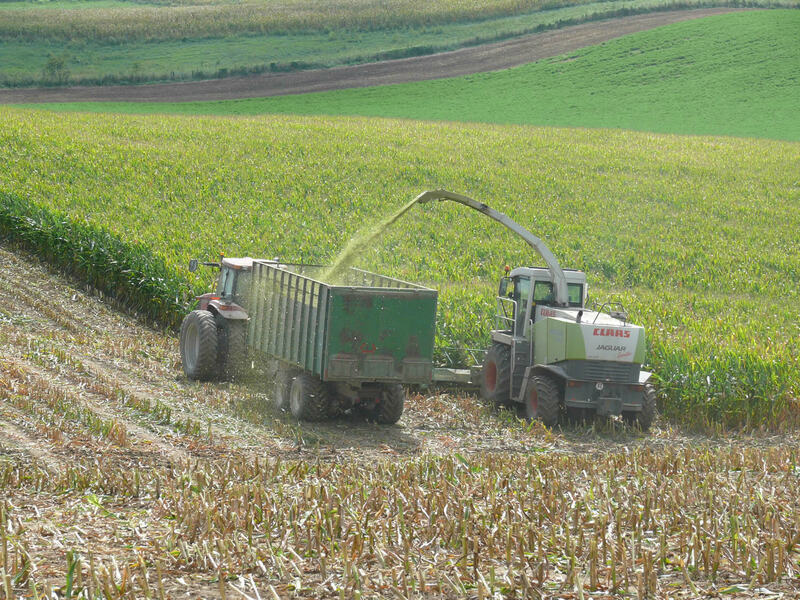 Iowa State University Extension and Outreach beef specialist Denise Schwab said a few basic principles of corn silage harvest are critical to harvest and store a high quality corn silage feedstuff. According to Iowa State extension dairy specialist Hugo Ramirez-Ramirez, the number one priority for high quality silage is to harvest at the right moisture content. The bacteria that convert the plant sugars into lactic acid need the right moisture to drive fermentation. Ideally, the plant should be at 35% dry matter or 65% moisture to facilitate packing the silage to exclude oxygen and promote fermentation. What options do producers have when the plant gets drier than this? One might be to switch the storage method. Retired Iowa State Extension forage specialist Steve Barnhart said the optimum silage moisture at harvest ranges from 55%-60% (40%-45% dry matter) for upright oxygen-limiting silos; 60%-65% for upright stave silos; 60%-70% for bags; and 65%-70% for bunkers. Pay particular attention to moisture measurements; agronomists tend to talk in terms of moisture level while animal scientists tend to focus on dry matter levels. Another option suggested by Dan Loy, Iowa State Extension beef feedlot specialist, is to consider switching from silage to earlage or snaplage. Earlage or snaplage is harvested at closer to 62%-65% dry matter. Earlage/snaplage is similar in protein levels but higher in energy value than traditional corn silage, so ration modification is needed, but it may provide a better feed storage option for corn that dries down prior to being able to get it chopped. Chop length and kernel processing are important for dairy producers. Ramirez-Ramirez suggests a theoretical length of cut of ¾ inch if using a kernel processor, or shortening the cut to ¼ to ½ inch without kernel processing. University of Nebraska—Lincoln research showed a 7% improvement in finishing cattle feed to gain by kernel processing. As the corn plant gets drier, smaller particle size may aid in improved packing and fermentation but also needs to offset the cost of the additional processing. Inoculants with lactic acid-producing bacteria will help speed the drop in pH to around 4.0, thus improving the fermentation process. This is particularly important in situations where an efficient fermentation process may be compromised. As standing corn becomes dryer, inoculants become more important. Whether it is silage, snaplage or earlage, Ramirez-Ramierz recommends that producers look into inoculants that contain Lactobacillus buchneri. This particular microorganism has been shown to improve “shelf life” or increase aerobic stability during the feed-out phase. This translates into less heating and less spoiling once the silage is open. Packing also is critical and becomes more of a challenge with dry silage. Packing eliminates oxygen, which aids in the anaerobic fermentation process. Silage density needs to be around 14-16 pounds of dry matter per cubic foot to exclude oxygen. Bunkers and piles should be packed in layers no more than 6 inches at a time. Density is dependent on crop type, moisture, chop length, type of structure, delivery rate, packing weight and time. With dry silage, err on the side of extra packing time and weight. The final and most important practice for quality silage is to seal and cover the silage, both to prevent the entrance of oxygen and to keep rain from infiltrating the silage. With less than ideal chopping and packing situations, consider adding both an oxygen barrier layer as well as a plastic cover. The oxygen barriers are special thin films that don’t allow oxygen penetration, whereas the traditional plastic silage cover prevents water infiltration. Both need to be weighted down to prevent air infiltration. If using old tires, be sure they all are touching other tires to get full coverage of the plastic. These good practices are important for quality silage every year, but even more important in years like 2018 when wet weather is delaying silage harvest. For more information on making quality silage, contact your Iowa State Extension beef specialist or dairy specialist. The Iowa Beef Center at Iowa State University was established in 1996 with the goal of supporting the growth and vitality of the state’s beef cattle industry. It comprises faculty and staff from Iowa State University Extension and Outreach, College of Agriculture and Life Sciences and College of Veterinary Medicine, and works to develop and deliver the latest research-based information regarding the beef cattle industry. For more information about IBC, visit www.iowabeefcenter.org.